EWING — With the help of some miniature robots, officials at The College of New Jersey broke ground Tuesday on a new 89,000-square-foot STEM building that will give its engineering and science programs 60 percent more classroom and laboratory space. The building, which will house the biomedical engineering, computer science and mechanical engineering departments, will be the anchor of a larger STEM Complex that already includes the Biology Building, Science Complex and Armstrong Hall. 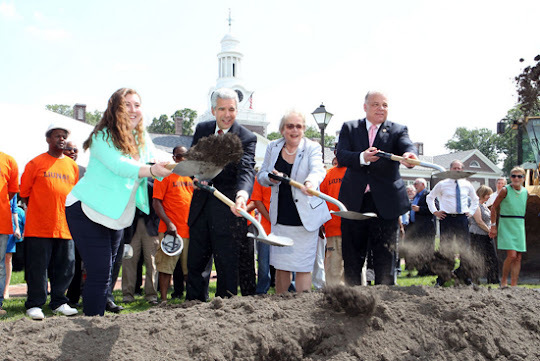 "We're not building this building because we hope to have good STEM programs," TCNJ President R. Barbara Gitenstein said. "We're building on success here and we're giving these already strong programs the support and facilities they need and deserve so we can continue to serve our state's economic workforce needs." Some of the building's highlights include biosafety level-2 testing labs, a robotics lab, a cluster of 300 servers for faculty and student researchers, a design studio that will allow mechanical engineering students to take projects from concept to validation, a thermo-fluids lab and a metal fabrications and assembly workshop. A 26,300-square-foot Chemistry Addition to the college's Science Complex will house a multidisciplinary super laboratory suite that will allow for the seamless transition between computational, experimental and analytical activities. Another suite will have two organic chemistry labs, storage rooms, a prep lab and study spaces. A two-story connecting wing between the new STEM building and Biology Building will feature a cafe, tables and seating for students and faculty. School of Science Dean Jeffrey Osborn said the buildings were designed for the kind of teaching and research that is needed in the 21st century. The physical connection between the science and engineering departments will also help to create synergy, he said. "What that provides is the opportunity to break down barriers that exist between disciplines," he said. "When our students graduate from TCNJ and enter the workforce ... they're going to encounter problems. Not chemistry. Not engineering. Not computer science. So we want to give them the tools that they need to wrestle with these multidisciplinary problems." Sophomore Daniel Ponsini, 19, who helped program the robots for the groundbreaking ceremony, said he can't wait to have classes in the new building. "There's going to be a lot of new labs in the building that will give us more space to work," the electrical engineering major said. The project costs $75.4 million, $40 million of which comes from the Building Our Future Bond Act, which was approved by voters in November 2012 to provide $750 million in grant money to state colleges and universities. State Senate President Stephen Sweeney, who sponsored the legislation, advocated for continued investments in higher education that would encourage more students to go to college in-state. "New Jersey is the No. 1 exporter of our children to other parts of the country," he said. "Making investments like this makes a direct investment in the state of New Jersey and when we're done, we have to go back and talk to the voters again because this initiative is welcomed but wasn't enough. "Our investment in higher education is going to drive our economy again," he continued. An additional $1 million in funding will come from the New Jersey Higher Education Technology Infrastructure Fund. The college will fund the rest, with $2 million of TCNJ's first comprehensive campaign going toward the STEM Complex. The project is expected to be complete in August 2017.